For this month's No Croutons Required I asked you to create a vegetarian soup or salad featuring the humble courgette or zucchini as it is sometimes known. I really didn't realise how versatile this unassuming vegetable could be until the recipes started pouring in. Have a look and see what you think. Do take the time to vote for your favourite. Johanna has the most gorgeous little lemon tree in her garden and the lemons are ripe and ready for picking (you must go and have a look at the photo. It is the sweetest little tree). 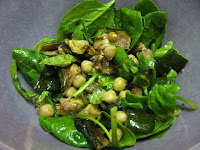 So she decided she just had to add some lemon to the most appealing blueberry dressing which coats her salad of zucchini, mixed green leaves and chickpeas. 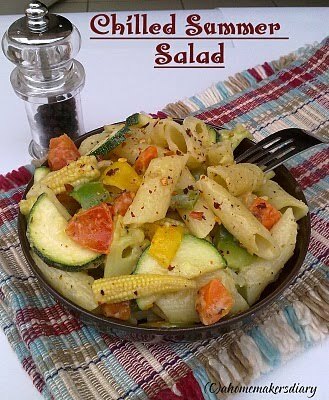 This is Sayantani's first time cooking zucchini and she has certainly done it proud in this vegetable packed pasta salad. Zucchini, carrot, potato, cauliflower, beans, capsicum, baby corn, onion, garlic and tomato, all lovingly swaddled in a luxurious cheese sauce. Mmmmmmmmm, my mouth is watering just thinking about it. Janet transports us to Turkey with this salad. After gathering all the ingredients she needed, Janet baked zucchini and apples and then sprinkled them with chopped hazelnuts and drizzled on the most lush lemon and hazelnut sauce. Janet tells us "The winner in this recipe is the lemon hazelnut sauce. It is deliciously creamy with the roasted hazelnuts ground to a thick paste with garlic, and then infused with fresh lemon juice and olive oil". Sounds good, doesn't it and I just love the stripey zucchini. I don't think I can describe this dish as eloquently as Suzy, apart from saying I want to dig my fork into this right this minute, so I will let Suzy tell you in her own words. "Its a delicious pasta salad where the zucchini and carrots practically melts into the pasta creating a delicate texture. The tomatoes add some extra color and a bit of moisture to the dish. The portabellos on top give this salad a whole extra dimension allowing it to stand on its own as a main dish instead of just an interesting side." I hasten to add that Suzy has continued on to make this recipe over and over. The photo she has given us is of her first attempt, which mainly starred zucchini (just in case you are wondering where the carrot and tomatoes are). I bucked the trend and made soup with my courgettes. As soon as I had settled on my choice of ingredient, I knew what I was going to make. This is a simple soup I used to make fairly regularly, but haven't made for years now. I souped (forgive the pun) up the recipe by adding some cumin and cannellini beans and I was thrilled with the resulting rich and creamy soup. It is lovely and sunny here, so I could have served my soup cold, but heck, I like my soup hot, so that is how I served it. This salad is one for bbq season. Courgettes, red peppers, baby plum tomatoes, rocket leaves and spinach leaves. The courgettes and pepper are cooked on the grill for a lovely smoky flavour and the whole salad is coated in a lovely mustardy dressing. I think this would be a great salad to take along to a picnic. Doesn't this look amazing? It must taste fabulous. 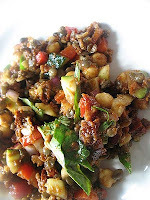 It is a combination of zucchini, puy lentils, chickpeas, red onion, red pepper, jalapeno pepper, sun-dried tomatoes and all dressed up in a sun-dried tomato dressing and a scattering of fresh basil. Mmmmmmmmmm, love it Lisa! This is a real flavoursome soup that Vanessa has cooked up. She serves it cold, although her hubby, like me, likes his soup hot. It's a personal choice really, isn't it? She has certainly packed plenty of taste into her soup, whichever way it is enjoyed. 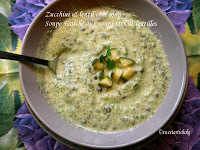 Zucchini, black lentils, ground cumin, garlic, coriander leaves and yogurt. Don't you just want to dive in? Mangocheeks grows her own courgettes, but they weren't quite ready to pick yet, so she bought some from her local farmer's market. 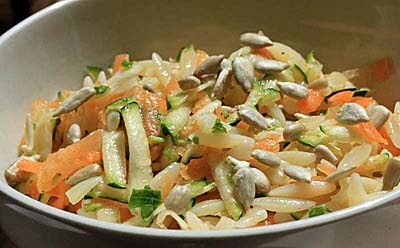 She grated the courgettes along with carrots, added orzo pasta and some crunchy seeds and dressed her salad with olive oil, white wine vinegar, salt and pepper. 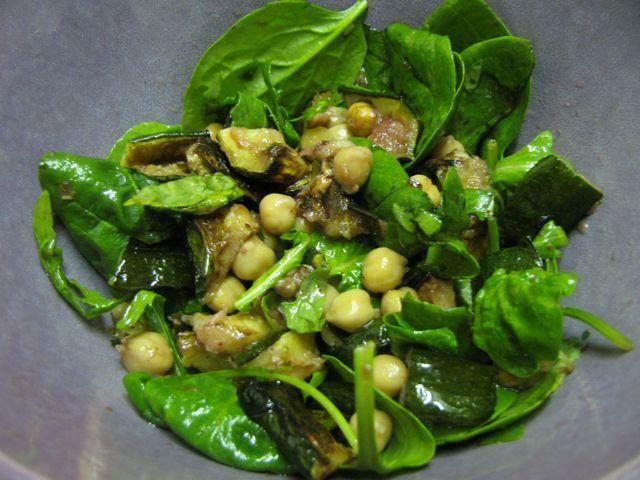 A simple, but delicious salad with a bit of crunch. Denny is marketing this as finger food. I think that's a pretty exciting way to serve up salad, although I could see myself getting into a right mess, but with a napkin at hand, who cares. The salad dressing is super tasty. 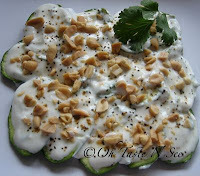 Yogurt, lemon juice, freshly chopped mint, salt, freshly cracked pepper, ground cumin and topped with crunchy salted peanuts. Slurp! 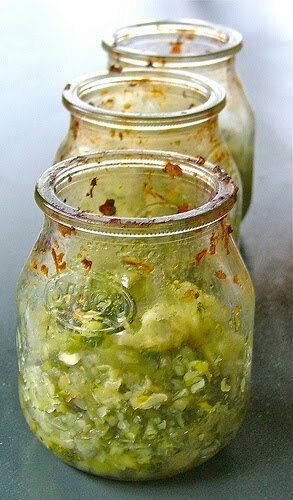 Those little jars of zucchini look fab, don't they? Brii whizzed up the zucchini, together with garlic, scallion, sage leaves and olive oil, in a mixer then left to marinade for 4 hours, although if you have the time, leave it for 24 hours in the fridge and it gets even better. As well as salad, Brii recommends using these marinated courgettes as base for a soup or on top of pizza, focaccia or quiche. Lovely! This delicious entry is from my good friend Hilary. She doesn't have a blog but wanted to join in this month and her food is always stupendously good, so I was more than pleased to accept her entry. Hilary is a joy to be around, she is one of those people that really sparkle and I think you could describe this soup in the same way. Think of a traditional Vichyssoise, but change the leek for courgettes. So, another cold soup for you to consider. I will be publishing this soup over the next couple of days, so that you have a chance to judge it along with the other entries. Grilled veggies really enhance the flavour of this wonderful soup. 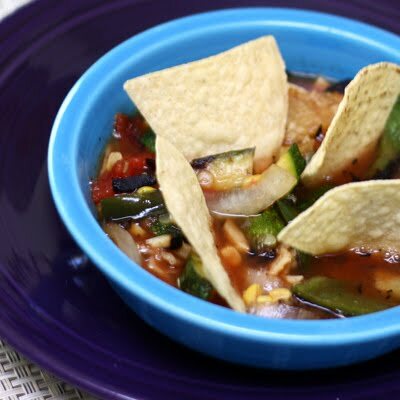 Zucchini, corn, poblano peppers, sweet onion, fire-roasted tomatoes and garlic are the base of this soup. Throw in some spices, tortillas and avocado and you have one humdinger of a soup and a big smile from those you serve it to. In case you don't know what carpaccio is, I will let Sweatha explain. "Carpaccio is a dish made of raw meat (or veggie as in my case) which is thinly sliced and topped with dressing or sauce and is served as an appetizer." Sweatha sliced her zucchini so thin that it is transparent. A mandoline is good for this, but watch your fingers, it is a dangerous beast. 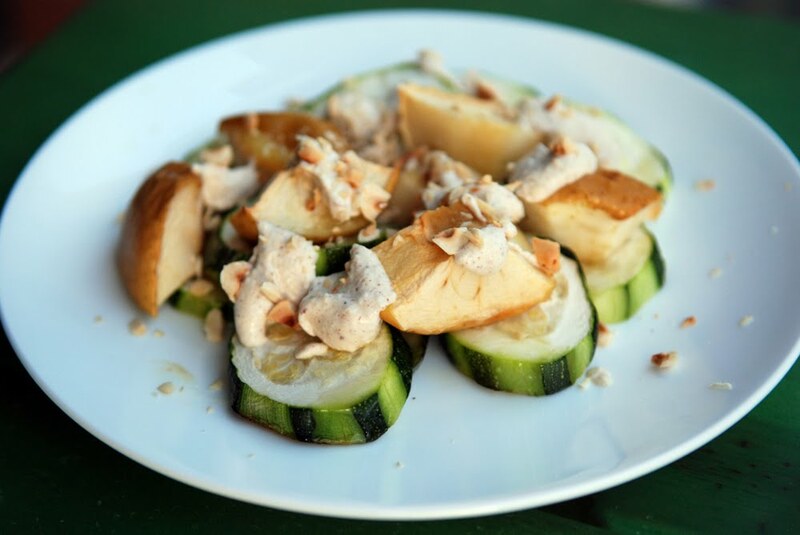 The zucchini is layered on to a plate, seasoned and topped with spring onions, chives, dill, crumbled paneer, toasted pine nuts and finished off with a lemony dressing. Tasty, tasty as my husband would say. This is another dish that makes the most of the excellent flavour that roasted vegetables bring to a meal. Maybelles mom roasts zucchini, cauliflower, potatoes, red onion and chickpeas. You just know it is going to be good already, don't you and that is before the veggies are tossed in spices. Garam masala, turmeric, ground ginger, cumin, salt pepper and olive oil. This salad is going on my list of must-haves! This, our last entry is from Brownievile Girl and I have to let her describe it to you. It sounds so good when she does. 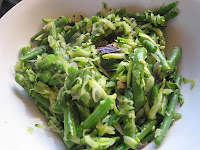 "The soft, smooth grated courgette was a wonderful textural contrast to the crunchy barely cooked french beans. The mellow caramelised onion brought a warm back note to this otherwise zingy salad." Mmmmmmmmm, did that description get your attention? It got mine. I think it is the carmelised onion that had me immediately and the salad is finished with a lovely mustardy dressing, one of my all time favourites. So that is the roundup and a stunning one it is at that. 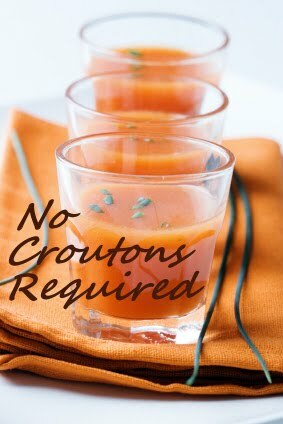 I am continually astounded at how each round of No Croutons Required just gets better and better. Please vote for your favourite dish. Keep moving down the page if you would like to see who won my veggie haggis or just to have a laugh at my inept independent adjudicator who kept throwing the hat in the air and scattering the names assunder. Oh well, he is only a few months old and we did get a winner in the end, although he thought he was in a spy movie and tried to eat the evidence. Very funny! So many delicious dishes all in one place Jacqueline. Great job with the roundup as always. Bookmarking this for when the zuchinnis start showing up in abundance! That was a great variety! Everything looks so good. Wow! Lots of tempting dishes here. As usual, you did a great job of putting this together Jackie. How adorable is your veggie adjudicator? I've never known a child that age who DIDN'T try to put everything in his mouth! 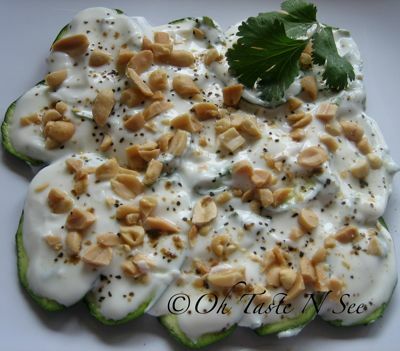 Wow - what a wonderful round-up of zucchini dishes! I can't wait to try them when I rack in zucchini. Brownieville's courgette and french bean salad looks really tempting, yum! Jacqueline, You always write up the entries with such great fondness and its not just for the dish, but the fellow blogger too. Thank you so much. PS Hilary should think about starting a blog, that soup looks so good. There are so many light and refreshing recipes here, Jacqueline! I'm especially intrigued by pairing apples and zucchini. I would never have thought of doing so but plan on trying it on. They all look so good, I don't think I could pick a favourite. It is hard to choose Choclette, definitely. Great roundup! It all looks fabulous! What a line-up of creative courgette recipes! So glad to see the veggie used in more than the ubiquitous bread and ratatouille, as good as they are. Sorry I missed joining this month, Jacqueline, but a big thumbs up for the theme. These look fabulous. I wish I had known about your round up. I make a mock crab cake that is made with zucchini. I think we eat it at least five times per summer/fall. Love it. I have to go now and check out some of these wonderful recipes. Hi Susan, I wasn't sure if I would get much enthusiasm for courgettes, but I was so wrong. Oh my - what an amazing list. I'm hard pressed to pick a favorite. They all just look so good. Definitely bookmarking some of these. I send a lot of zucchini coming my way in the future (its already been a mainstay of the organic box the last two weeks). Hi jacqueline, i think u have missed my entry, pls do check the mail, thanks in advance.. Thank you for directing me to your post here. I added it to my list, linking this wonderful post! I will be checking out all of these- they look so good.